Memorial Day weekend is here, and that means warm weather and fun times with friends and family, usually in the form of a cookout where I’m from. While grilled meats and skewered veggies plus cold beer are standard fair—oh and seemingly all the potato chips in the world (hey, it’s a very American holiday)—I like to bring something fresh and zesty to the party that cuts through all the fat. This year I’m sharing a side dish that is for adults only. 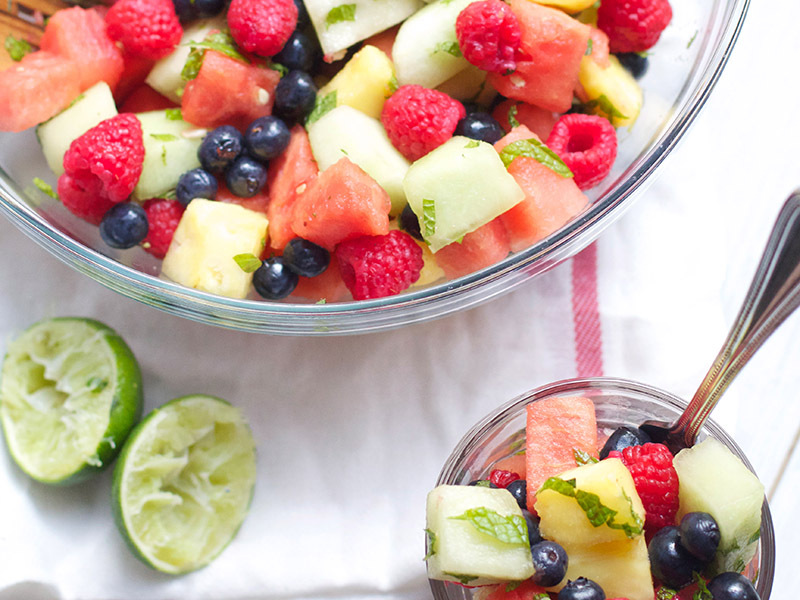 It’s a Mojito Fruit Salad that’s full of flavor and spiked with a little rum, all to mimic the refreshing minty taste of an actual mojito but with more nutrients and health benefits than an actual cocktail. If you’re hosting kids, just make sure to let the adults know you’ve spiked the fruit cocktail. Toss the ingredients together in a large bowl and let marinate in the refrigerator for an hour before serving. Enjoy!